Note: I'll have more on the employment report soon. The December ISM Non-manufacturing index was at 56.1%, up from 54.7% in November. The employment index increased in December to 56.3%, up sharply from 50.3% in November. Note: Above 50 indicates expansion, below 50 contraction. Economic activity in the non-manufacturing sector grew in December for the 36th consecutive month, say the nation's purchasing and supply executives in the latest Non-Manufacturing ISM Report On Business®. The report was issued today by Anthony Nieves, C.P.M., CFPM, chair of the Institute for Supply Management™ Non-Manufacturing Business Survey Committee. "The NMI™ registered 56.1 percent in December, 1.4 percentage points higher than the 54.7 percent registered in November. 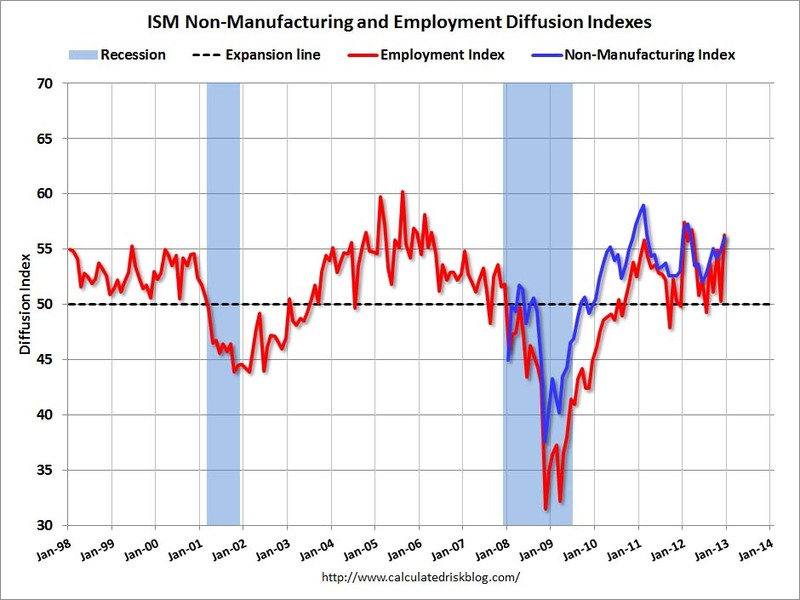 This indicates continued growth at a slightly faster rate in the non-manufacturing sector. The Non-Manufacturing Business Activity Index registered 60.3 percent, which is 0.9 percentage point lower than the 61.2 percent reported in November, reflecting growth for the 41st consecutive month. The New Orders Index increased by 1.2 percentage points to 59.3 percent. The Employment Index increased by 6 percentage points to 56.3 percent, indicating growth in employment for the fifth consecutive month at a significantly faster rate. The Prices Index decreased 0.4 percentage point to 56.6 percent, indicating prices increased at a slightly slower rate in December when compared to November. According to the NMI™, 13 non-manufacturing industries reported growth in December. Respondents' comments remain mixed and are mostly positive about business conditions and the economy." This was above the consensus forecast of 54.5% and indicates faster expansion in December than in November. 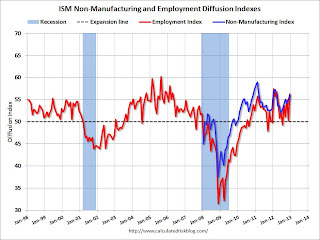 The internals were strong with the employment index and new order up.